“Make yourself at home,” commands the host in the United States. The intention is to help the guest, the invited one, relax and feel comfortable. But in practice, it’s hard to know exactly what this means. I naturally adapt my behavior to the surroundings and to the people who are present. If I were in my own home, I would not necessarily be relaxed and comfortable. I might just as readily be rushing around doing laundry, washing dishes, paying bills, or trying to clear the clutter off the dining table. Or, I might find myself drawn to the computer looking at Facebook, shopping on line, reading my email, or writing this blog. I also consider that one of the true pleasures of traveling is getting away from these chores and everyday activities in my own home. Traveling means washing a few things out in the sink maybe, not starting your Saturday morning with three loads of laundry. On the other hand, I am usually too inhibited to for other “at home” behaviors like singing in the shower or dancing around the room in someone else’s home. How can I make myself at home, just like that? It takes time to feel that comfortable. 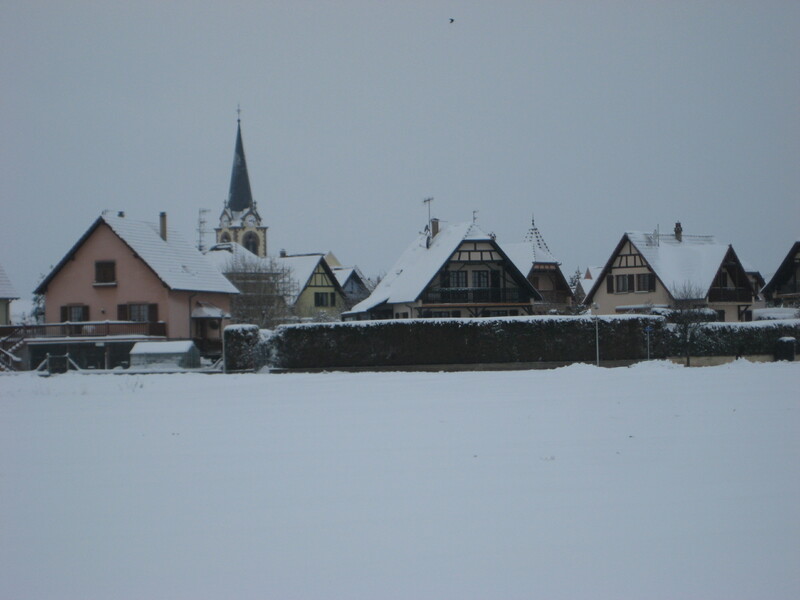 Recently we traveled to Alsace for the Christmas holiday for an overdue reunion with friends. We are “les invités” although frankly, we invited ourselves to join these friends and their family hoping to add to their pleasure but knowing that we also add to the work and expense of the holidays. In French, hôte is a role that applies to both host and guest, so not surprisingly, we fight over who has the right to pay the bill at the restaurant when we go out to eat. We are told not to bring anything with us when we eat at our friends’ home, but we do anyway. Our conversations are sometimes in English and sometimes in French because we all want to practice our language skills. My husband makes great strides in the new language because he never hesitates to try it. He tends to use whatever French words he knows to replace their English counterparts in his conversations. Sometimes he composes complete sentences in French. Though I am thousands of miles away from my actual home, I do feel immediately “at home” once we are with these long-time friends who will almost always understand my lazy French accidentally sprinkled with Spanish words and US phrasing. It’s not so much that I “make myself at home” but that these friends make me feel that I truly belong with them and among their family as we celebrate Christmas together. So I relax and am comfortable. We are nine in the house for dinner on Christmas Eve with ourselves, our friends, their adult children and their partners and my friend’s mother, who was my host mother for that summer after high school when I lived with their family in Strasbourg. This was the woman (and her daughter) who endured my tears and complaints when I didn’t yet feel at home, when the culture and way of life here seemed strange and even “wrong” to me. They didn’t hesitate to argue with me about small things like the fact that I wanted to shampoo my hair every day, or show impatience when I made them late, but they also never hesitated to include me in family circle. I was simply one of them, and my fondest memories include the many moments when I felt that strong connection. Strasbourg, France at this time of year calls itself the “Capitol of Christmas” and it is easy to get into this spirit. 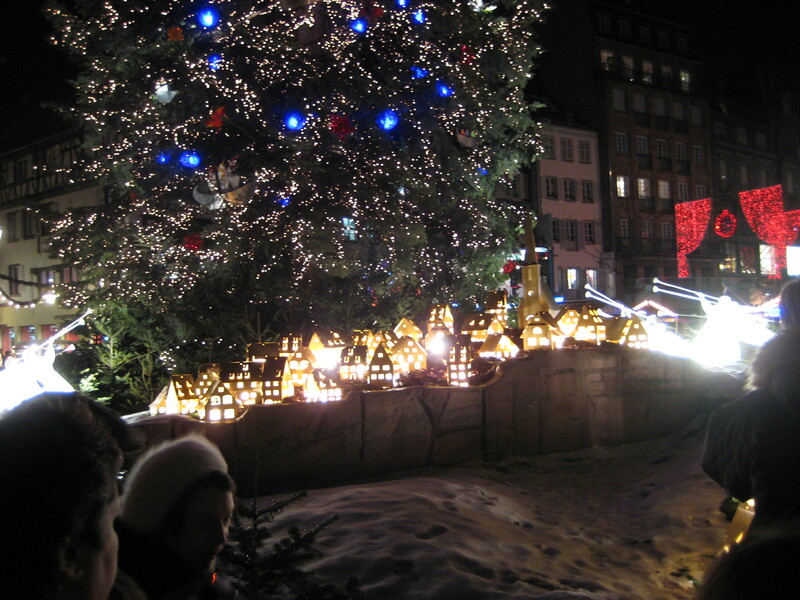 The air is filled with the citrus and anise scented “vin chaud” or hot wine that is sold for 2 Euro in many of the Christmas market stalls here, alongside ridiculous holiday hats in the shape of storks, delicate glass Christmas ornaments, gingerbread cookies and advent calendars. 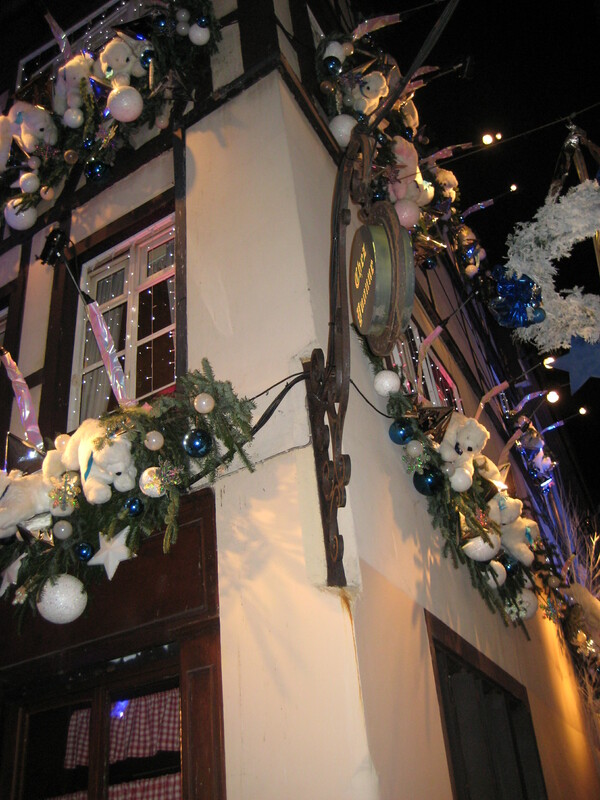 Buildings are decorated with lights and ribbons, stuffed bears, stars and glass balls. There has been some snow and more is expected. Christmas carols – often American tunes – are played, and children dressed in animal hats or hoods with mittens recount long stories to their parents who gently pull them through the narrow streets. The gray and foggy days end in darkness at 4:30 as the Christmas lights come on in the city as we step carefully on the snow-covered cobblestones. The narrow streets, the cathedral, the snow and decorations all seem to come from a much-loved fairy tale where magic still exists and the princess always gets her prince. We know that life is not always like this, but we set aside those thoughts for a while and let ourselves be drawn into the atmosphere. When my father started to lose his memory, it was as if he gained an entirely new set of memories. He remembered travels to Egypt that he had never taken, visits to France with his father (who had died when my father was 14) and explorations of India and Hong Kong. Wherever we took him, he recognized as a place he used to live many years ago. The house he and his father built — he was pretty sure — lay just beyond that hill, or around that corner. My father died nearly 13 years ago, and now it’s my mother’s memory that no longer quite works. But she is planning a journey. She wants to go home. She waits for the bus that will arrive to take her as far as the home of her aunt and uncle in Philadelphia, who will surely be happy to put her up overnight, and she thinks of other places she can stop on the way home. All these stops are with family and friends who have long since passed away. And no matter that we are there to visit her, she seems to believe that she is visiting us. This is not her home, and there seems no way to make it such. 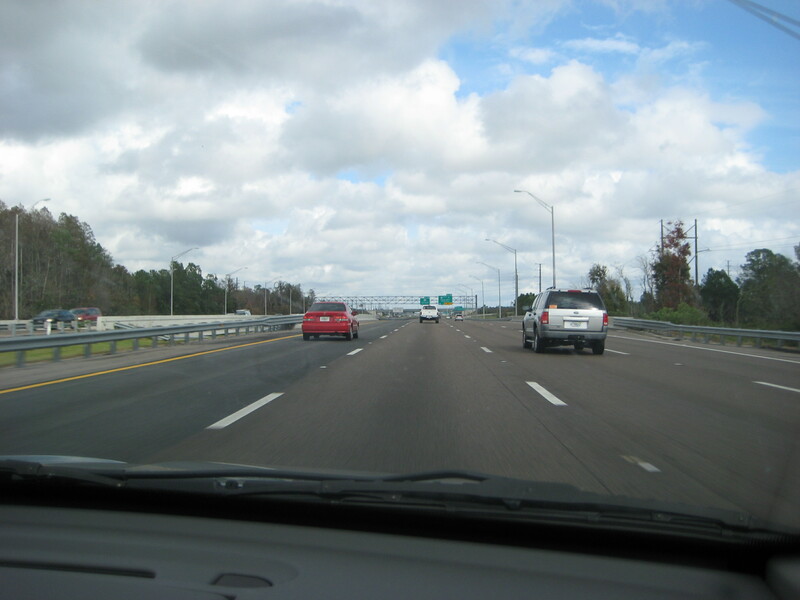 As my husband and I drive back north on the same route we took last week down to visit my mother in Florida, we both fully agree that it’s good to be going home. But the journey home is also quieter and more reflective than the journey away from home. We still notice a few new things along the way, but we mostly recognize places we’ve seen before. Mostly we think about where we’ve been and about what we’ll do now, after we get home. This is a transition place, or at least we treat it as such. And there is more than a touch of sadness to it. I think many study abroad students also experience this sadness on their flights home, perhaps especially those who may have felt ready for some time to go home. Homesickness happens to many people, but going home never really erases that experience, nor does it exactly promise a new beginning in the way that going away from home sometimes does. Going home concludes the journey and re-establishes our connection with this place. Driving home from Florida, we had many moments when we said, “Now we are home.” First when we reached the familiar places on the New Jersey turnpike we knew we were close and with each familiar landmark or recognizable space we renewed our feeling of being home. We identify ourselves as part of this place, and our lives move in this space and among the people here. For some reason, as the New Year begins, it is common in the English-speaking world to sing a song from a Scottish poet about not forgetting old acquaintances and times gone by. I feel the same nostalgia with the old Beatles’ song that goes “There are places I remember….” My mother remembers her aunt’s house where she lived for a while as a young woman before she was married. She remembers that she was a student at Southern College, a boarding school in Virginia that disappeared long ago, so sometimes she supposes she is there now, and that the school year will soon be over and she will be going home. So she asks again when the bus will come, the one that goes past that house in Bowling Green. Knowing that these places no longer exist, and that these people are long gone, I am the one, not her, to feel their absence. And I dearly wish that I could drive her home.